Please note that this program is now sold out. There will be a wait list starting at 6:00 pm on the night of the program. Any additional seats will be released at 6:30 pm in the order the names were received. You must be physically present when your name is called or your place will be forfeited. We do not guarantee that any seats will become available. To view all of our upcoming programs, click here. In a whirlwind of historic firsts, Shirley Chisholm became the first black woman elected to the U.S. Congress in 1968 and, in 1972, the first black candidate for a major party's nomination for President of the United States. 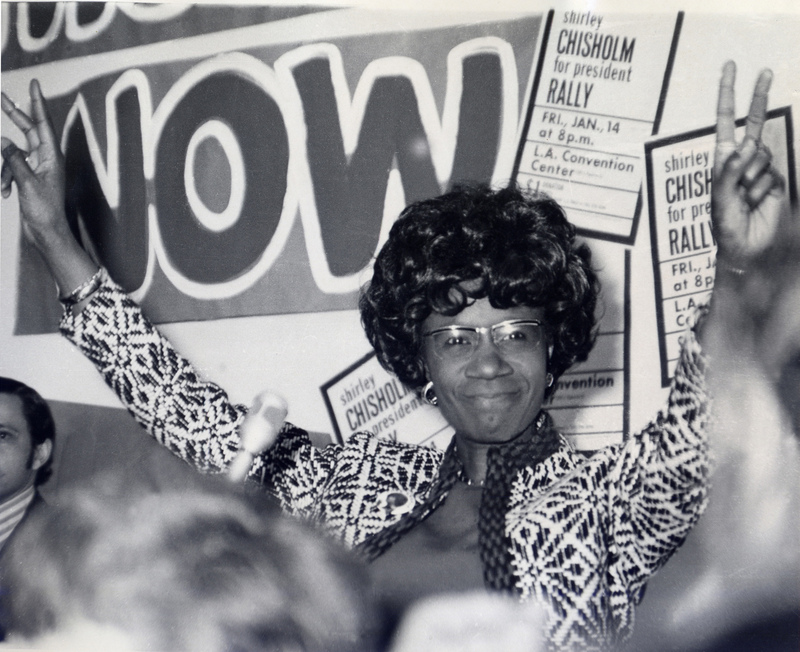 Join us for a screening of the Peabody Award winning documentary, Chisholm ’72: Unbought & Unbossed (2004, 75 min), which tells the extraordinary story of a woman claiming her place in American politics. Following the film, director Shola Lynch will discuss Chisholm's lasting legacy with political strategist Donna Brazile and Brooklyn Congresswoman Yvette Clarke, the current representative of Chisholm's former Ninth Congressional District. Lieutenant Governor Kathy Hochul will introduce the program. Please note that due to a scheduling conflict, Congresswoman Barbara Lee will no longer be able to participate in this event. This program accompanies our exhibitions, Beyond Suffrage: A Century of New York Women in Politics (on view through August 5, 2018) and Activist New York (ongoing). To view more Beyond Suffrage programs, click here, and to view more Activist New York programs, click here. Donna Brazile is a veteran Democratic political strategist, syndicated columnist, television political commentator, Vice Chair of Voter Registration and Participation at the Democratic National Committee (DNC), and former interim National Chair of the DNC. Brazile worked on every presidential campaign between 1976 until 2000, and was the first African-American to manage a presidential campaign. Her most recent book, Hacks: The Inside Story of the Break-ins and Breakdowns That Put Donald Trump in the White House was published by Hachette in November 2017. Congresswoman Yvette D. Clarke represents Brooklyn's Ninth Congressional District. She currently serves on the Energy and Commerce, Small Business, and Ethics committees. In addition to her committee work, Congresswoman Clarke is the At-Large Member of the Congressional Black Caucus, Chair of the Multicultural Media Caucus, Co-Chair of the Black Women & Girls Caucus, and Co-Chair of the Congressional Caribbean Caucus. Congresswoman Clarke currently resides in the neighborhood where she grew up, in the Flatbush section of Brooklyn. Shola Lynch is an award-winning American filmmaker based in New York. Her feature documentary Chisholm '72 premiered at the Sundance Film Festival in 2004, aired on PBS’s POV series, and garnered two Independent Spirit Award nominations and a Peabody Award. Her most recent film, FREE ANGELA and All Political Prisoners, documents activist Angela Davis’ crime and flight from the FBI in 1970. Since 2013 Lynch has served as the Curator of the Moving Image & Recorded Sound division of the New York Public Library’s Schomburg Center for Research in Black Culture. Lynch is currently working on several film projects including her first narrative feature tentatively titled “The Outlaw." Groups of 10 or more get discounts, email or call us at programs@mcny.org or 917-492-3395. Accessibility: Assistive listening devices are available and our auditorium wheel chair lift can accommodate manual, electric, and motorized wheelchairs. Please contact the Museum at 917.492.3333 or info@mcny.org with any questions. Support for this program is provided by the New York State Women’s Suffrage Commission. Programs offered in conjunction with Activist New York are made possible by The Puffin Foundation. Activist New York is the inaugural exhibition in The Puffin Foundation Gallery, which is dedicated to the ways in which ordinary New Yorkers have exercised their power to shape the city's and the nation's future. Special thanks to Eleanor's Legacy, the Girl Scouts of Greater New York and the New York Women’s Bar Association.